WAKE! for the sun has driven in equal flightThe stars before him from the Tee of Night,And holed them every one without a Miss,Swinging at ease his gold-shod Shaft of Light. WAKE, Loiterer! for already Dawn is seenWith her red marker on the eastern Green,And summons all her Little Ones to changeA joyous Three for every sad Thirteen. NOW the fresh Year, reviving old Desires,The thoughtful Soul to Solitude retires,Pores on this Club and That with anxious eye,And dreams of Rounds beyond the Rounds of Liars. CAMPBELL indeed is past with all his Fame,And old Tom Morris now is but a name;But many a Jamie by the Bunker blows,And many a Willie rules us, just the same. 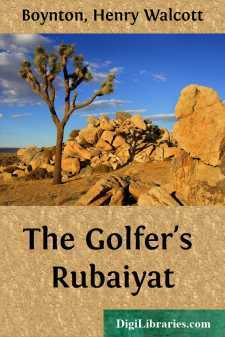 A THOUSAND lips are lockt; but still in hoarHigh-balling Andrew’s Shrine, with “Fore, fore, fore!Oh, fore!” the Golfer to the Duffer cries,That reddened cheek of his to redden more. COME, choose your Ball, and in the fire of SpringYour Red Coat, and your wooden Putter fling;The Club of Time has but a little whileTo waggle, and the Club is on the swing. WHETHER at Musselburgh or Shinnecock,In motley Hose or humbler motley Sock,The Cup of Life is ebbing Drop by Drop,Whether the Cup be filled with Scotch or Bock. EACH Morn a thousand Matches brings, you say;Yes, but who plays the Match of Yesterday?And this first Summer month of opening GreensShall take this Championship and That away. WELL, let it take them! What have we to doWith Championships, or, Champion, with you?Let This or Other struggle as he will,For him alone the Strife—for him to rue. WITH me along the strip of sandy DownThat just divides the Desert from the sown,Where name of Shop and Study is forgot,—And Peace to Croker on his golden Throne! A BAG of Clubs, a Silver-Town or two,A Flask of Scotch, a Pipe of Shag—and ThouBeside me caddying in the Wilderness—Ah, Wilderness were Paradise enow. SOME for the weekly Handicap; and someSigh for a greater Championship to come:Ah, play the Match, and let the Medal go,Nor heed old Bogey with his wretched Sum. BUT those who keep their Cards and turn them in,And those who weekly Handicaps may win,Alike to no such aureate Fame are brought,As, buried once, Men want dug up again. THE shining Cup men set their hearts uponIs lost to them—or won them; and anon,Like a good Three set in a bald Three-score,That Glory gleams a moment—and is gone. THINK, in this worn, forlorn old Field of Play,Whose Green-keepers in turn are Night and Day,How Champion after Champion with his PompAbode his destin’d Hour and went his way.